Experimental area 6 is situated on very wet land. This fallow was used as a meadow till 15 years ago. For 15 years this area has not been farmed. Along the rivulet the vegetation is categorised as “Humid tall herb fringes of watercourses and woodlands” (NATURA-Code 6431). 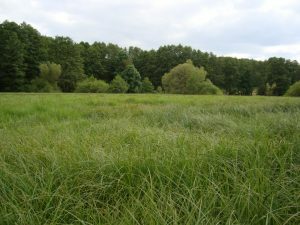 The all-over grassland area is furthermore habitat for characteristic bird species of the EU bird sanctuary “Vogelsberg”. The site is located close to Frischborn and part of the nature protection area “Mönchswiesen”. Dominant plant species are Scirpus sylvatica, Carex disticha, Calamagrostis canescens and Filipendula ulmaria.